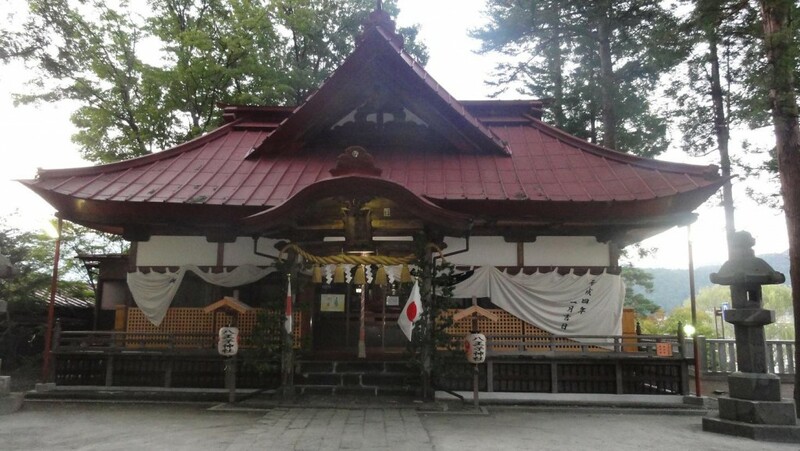 This is the fifth part of my article series detailing my honeymoon in Japan this September. The retelling of our adventure ends here, but the promised “Special” part with some truly special Japanese experiences and impressions will be the last one. Enjoy! All photographs in this article have been taken by me and my wife. You can click on them to see them in bigger size. As we came back to Tokyo from Nagano, on our way to the hotel, we saw a terrifying sight – robots had already started their invasion! 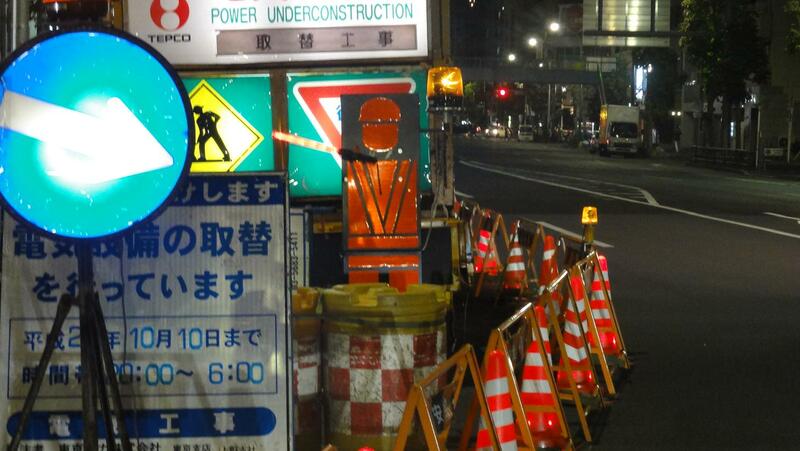 A figure of a construction worker with a light stick attached was guiding us instead of a real person… Scary! We spent some time that night researching where to go on our final full day in Japan (the last would be clearly reserved for Tokyo, we couldn’t risk missing our plane)… Unfortunately, that brought no results, we were quite tired and went to bed (not before the first real earthquake I felt in Japan… It wasn’t terribly strong, but it was a pretty long one, probably a good 40 seconds! My wife was lucky enough to already be asleep). I even got up early on the next day to continue the research, but we eventually decided to just head to Fujikawaguchiko (富士河口湖) – the place we’d failed to go with the group and see Mt. Fuji from up close! But we still took a while to get going, and it was nearly 10 AM before we even left the hotel. To make matters worse, we messed up at the train station and caught a much slower train instead of the express one to Otsuki. Thus, we had to change trains in Takao to get to Otsuki, where we’d change to a private line for Kawaguchiko. 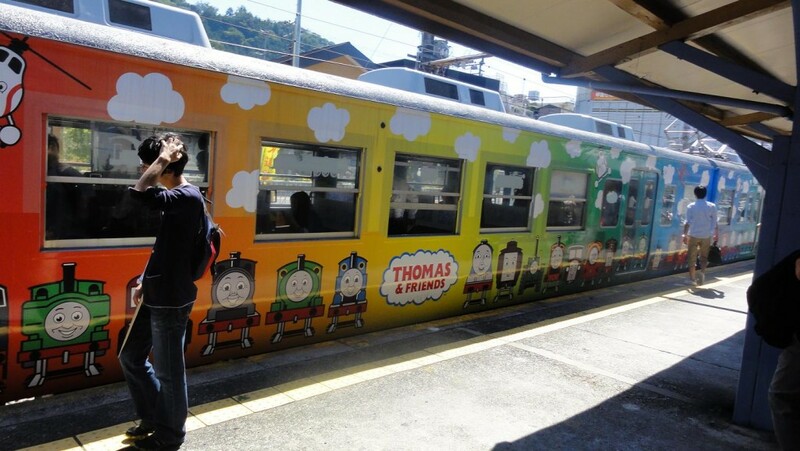 We probably lost a whole hour due to our train mistake (well, at least we rode on the Thomas the Tank Engine-themed train, apparently that’s popular in Japan), and only managed to get to Kawaguchiko in the early afternoon. Still, we had great ambition to see the wonderful lakes and plenty of tourist attractions nearby… It’s laughable how far from reality that ambition ended up being. 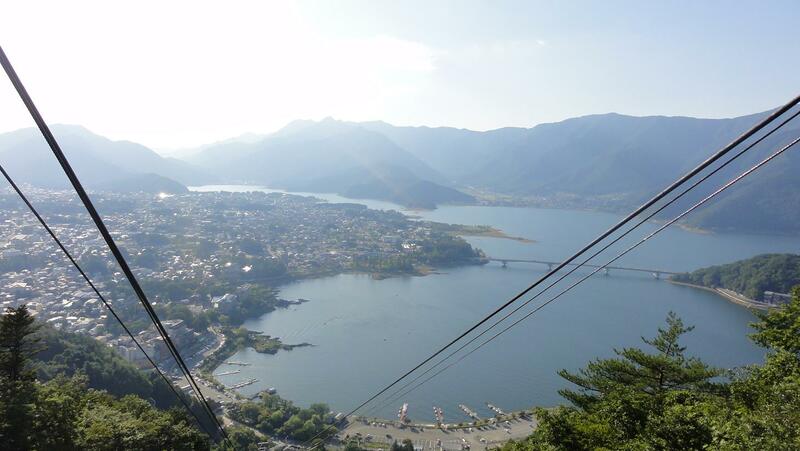 We bought day tickets for the bus line going around the bigger lake, and got off at the Kachi Kachi Ropeway, the first interesting attraction that had caught our attention. 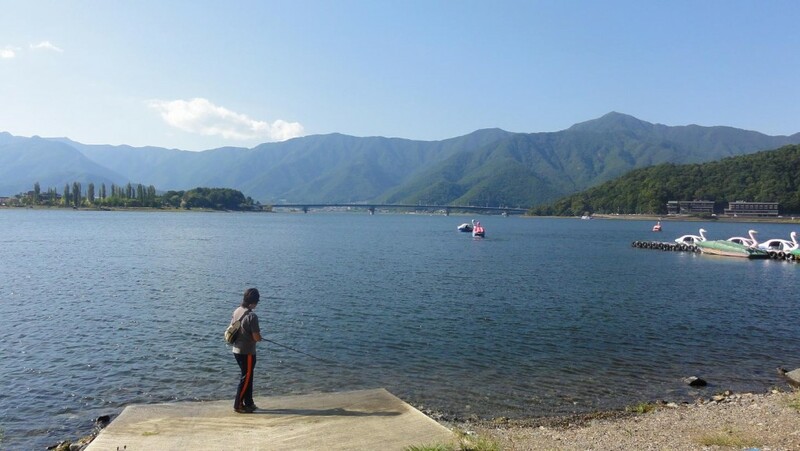 Before heading there, we decided to take a walk at the shore of the Kawaguchi lake… And it’s truly a huge lake. We walked for almost an hour, enjoying its beauty, and looking at people on swan-shaped pedalos inside. We decided to also rent one, but later on. I didn’t miss the chance to dip my feet in this lake’s water, too. We also saw a surprisingly not well-kept garden – a sight you will NOT see often in Japan. 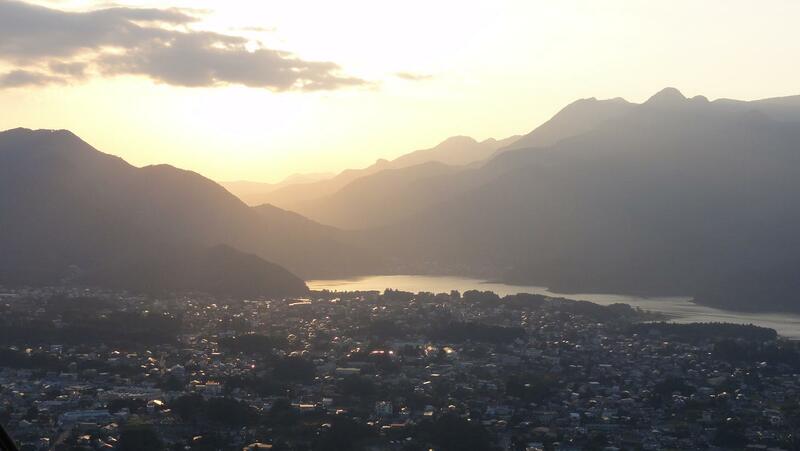 Then, we headed to the ropeway before it got too late in the afternoon… We hoped we’d get a good sight of Mt. Fuji from up there, and we did! The place seemed to be really child-oriented, with a cartoony tanuki and a rabbit (apparently characters from the old Japanese tale of the same name) being the mascots of Kachi Kachi Yama. Naturally, there were some kids there, but also plenty of older tourists. As soon as we got on top, we saw a photographer taking pictures of people with Mt. Fuji as the background. 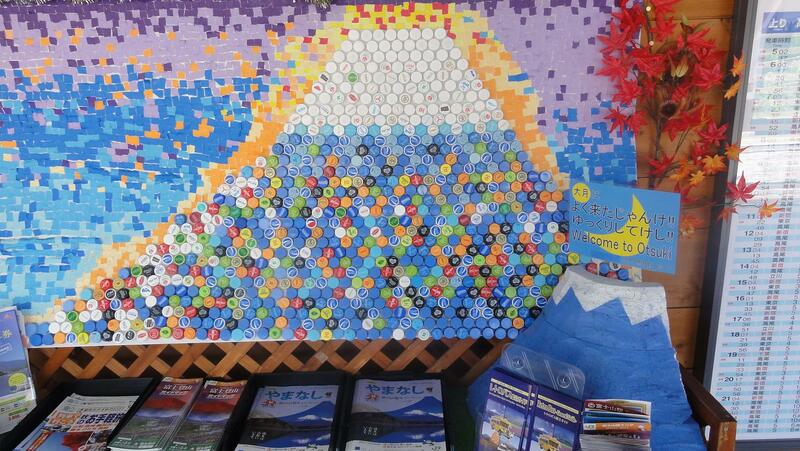 You’d receive a completely free postcard of Mt. Fuji with a small rectangle of your picture at the bottom middle, and there was the option to buy your picture in big size for 1000円… Needless to say, as Mt. 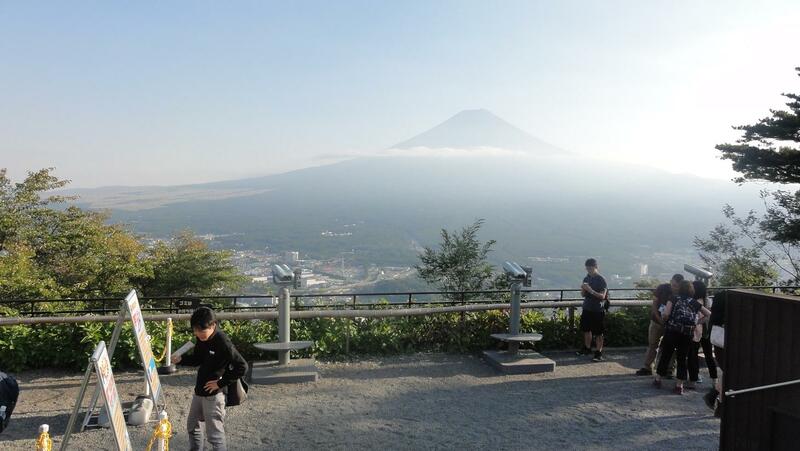 Fuji wasn’t exactly easily captured on photo, we paid up for the picture. We did manage to get Mt. Fuji on our own photos, too, with some adjustments of our camera’s lighting settings. As we went for a walk in the park away from the ropeway, we met a couple of Japanese guys trying to take a photo with the volcano in the background, but coming short… Miraculously, they had the exact same camera as ours, and my wife quickly made the same settings as ours, so that Mt. Fuji would be visible on theirs, too… Unfortunately, it still didn’t work, and I only came up with the real solution – putting their SD card into our own camera and taking the photo with it, some 10 minutes after we’d said goodbye to them. Shame. 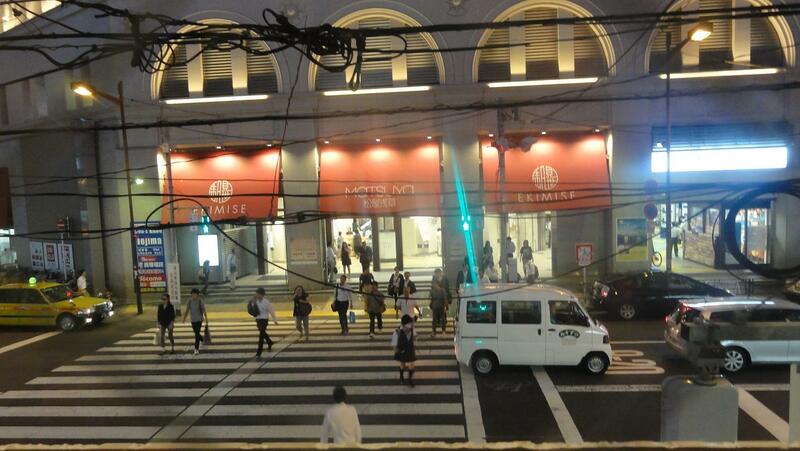 It was our last night in Tokyo… And we wouldn’t just let it go like that! 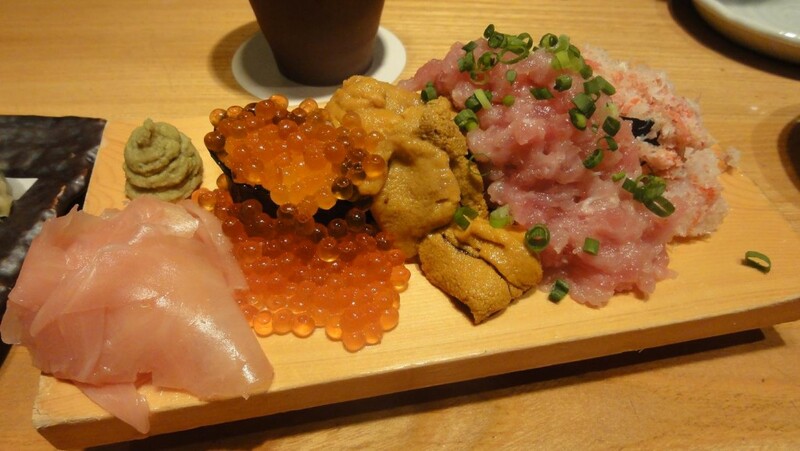 Once in the vicinity of our hotel, we decided to go into a wonderful small fish restaurant we had noticed the other day on Asakusa Dori street. And was it a GREAT choice… We ordered some fresh fish dishes, the most expensive sushi set (translated as “mouth-watering sushi” :)), fish salami, and sweet potato fries. For a drink, we picked a sweet potato shochu, which sounded quite interesting. Unfortunately, they’d run out of two of the things we wanted, but everything else was delicious, especially the sushi! 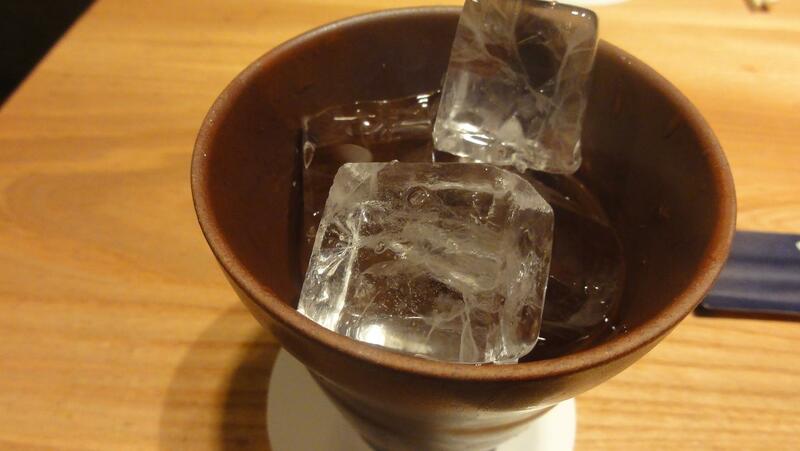 The shochu had a nice taste, and was served with LOTS of ice – remember, the Japanese get drunk easily, they probably need so much ice in their hard liquor to soften the effect. On our way out, the waitress and the cashier were so incredibly happy to have had us (I assume they don’t get too many foreigners), urging us to pick up lots of the candy that was available at the cash register. Thanks to their positivity, I felt happy. We left the restaurant, but that wasn’t it for the night! We decided to find karaoke, and headed to the nearest Karaoke-kan that showed up on my map application. To our surprise, instead of a bar like we were used to in Bulgaria (though I’d only ever visited one such place here, and didn’t even sing), we entered a hotel-like building with a guy at the reception who didn’t speak much English. Still, we managed to get by somehow, understanding each other thanks to his paltry English and my even paltrier Japanese. We ordered a couple of mojitos, he directed us to a room number on the 5th floor, and we got into the lift, filled with curiosity. As we reached our room, it was a truly tiny chamber with a sofa, a small table in front of it, a TV, and a karaoke device with a touch-screen remote control. And a couple of microphones for us to use. 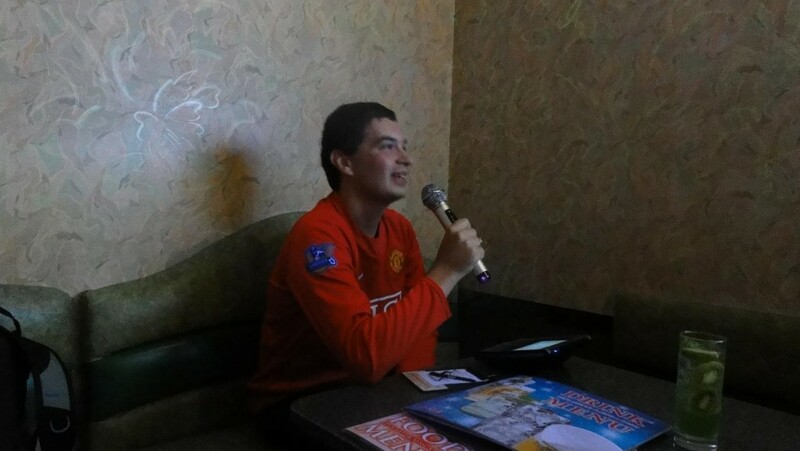 A few minutes passed before I could even get the karaoke machine working, but I managed to select a song, and was gradually learning how to use the remote control, which was ENTIRELY in Japanese. It must be said, this karaoke place was the least foreigner-friendly place I went into during my whole trip in Japan. Either way, we got by, I tried singing some anime songs by reading the hiragana, and didn’t do too terribly, at least during the reasonably slow parts. We also found some songs in English that we could both sing to and enjoy. It was really fun! By the time we got done, 2 hours had passed… And we headed to Chisun Inn for our last night’s sleep during our trip in Japan. On the next and final day, we first went into the Bandai building right near the hotel, we browsed the toys and games on display, and took some pictures with the cool statues in front of it (including Pac-Man and Doraemon). 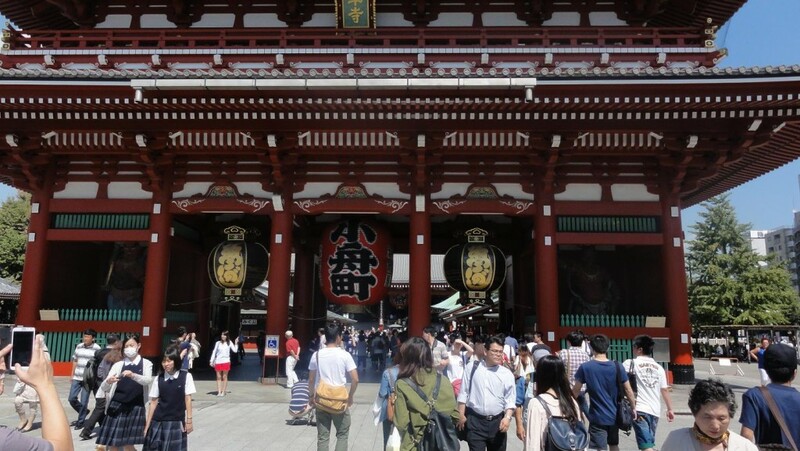 Then, we headed to the biggest Asakusa temple called Sensoji, a truly large and beautiful structure. 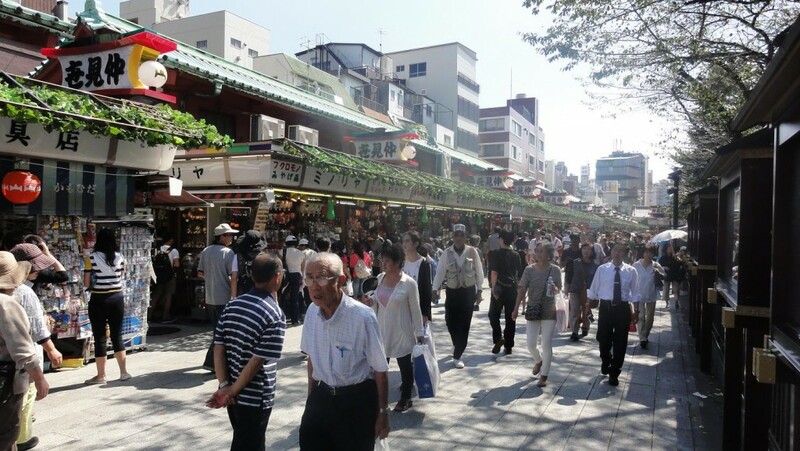 After checking it out, we continued on the shopping street leading to it – it has a staggering amount of shops and people. And that was on a Friday late morning/noon… I don’t even want to think what it’s like during the weekend. There was a hint of old Tokyo houses on the nearby streets… It was beautiful. We did some souvenir shopping, I even got a gacha figure of some anime girl, and then we headed to our next destination – Roppongi Hills. We’d read about a rooftop garden in the Mori Tower there, and my wife, an avid gardener, really wanted to see it. I was also quite curious, and we caught the metro there. 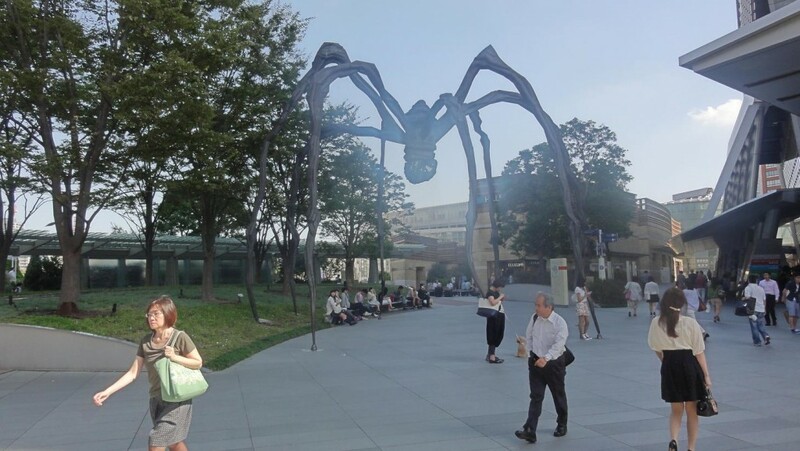 As we headed to the tower itself, we saw a huge spider statue that looked quite badass. Unfortunately, once we got inside, the receptionist informed us that the rooftop garden was not open to the public… Still, we were eager to make the best of our little time left in Tokyo, and, after a walk into the small, but soothing garden near the tower, headed to our next destination, Akihabara. We were coming back to Akihabara with a clear goal in mind – the Super Potato video game store, specialising in retro games. People at GameFAQs recommended I went there, and I thought it’d really be worth it. We had a little trouble finding it, but managed to before too long, and I was soon browsing the Famicom games on the first floor. I found Captain Tsubasa II, one of my favourite games of all time, and decided to buy it, as I didn’t own an original Japanese copy, just a Chinese bootleg one. Then, as I went to the cash register, I noticed adorable pixelated Kunio and Riki keychains, mirroring their NES/Famicom models exactly! I got Riki for myself and Kunio for my brother. Each of the following floors was getting closer to the present time, I even got to see what a VirtualBoy was like, and my wife even played a little bit. On the top floor, there were some old-school arcade cabinets, with quite a few Japanese guys playing. Arcades may have practically died long ago in Europe, but they sure are still big in Japan. 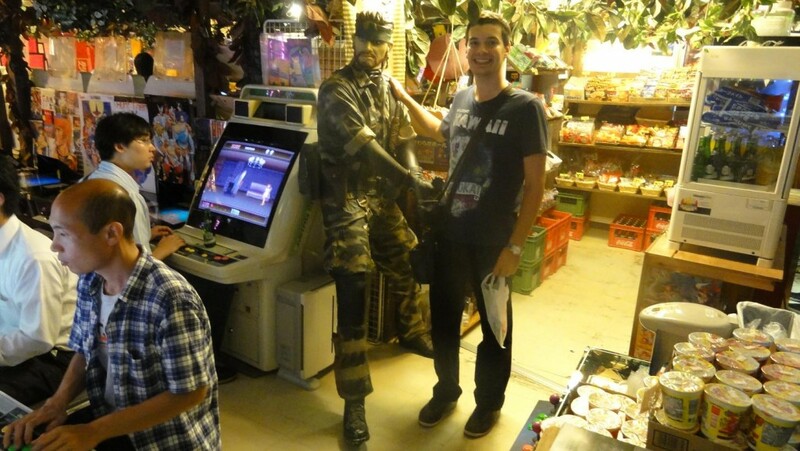 And there was also a statue of Naked Snake from Metal Gear Solid 3, I didn’t miss the chance to take a photo with him! Unfortunately, the time for our plane was coming closer and closer, and, after a final drink at Excelsior Café and some quiet watching of Japanese people hurrying around outside in melancholy as the sun set, we went to pick up our bags from the hotel, and headed to Ueno station, to head to Tokyo station and then the Narita airport… We only managed to get to Narita some 80 minutes before our flight, and I felt a bit sad we didn’t miss it – Tokyo Game Show was to be open for the public on the next day, and I was going to miss this golden opportunity to attend… If only I’d checked the TGS dates back in early March when the tickets were booked, I surely would’ve delayed our return with another day. A mistake I’ll hopefully be able to make up for in the future. After checking our bags and getting some last souvenirs, and, more precisely, food and drinks from Japan, we boarded the Qatar Airways plane, and it was time to say goodbye… For now, but not forever. Thank you, Japan, we will be back before you know it! But this is not everything from this article series… Come back next time for a final, Special chapter talking about Japan’s biggest highlights in my eyes, including the Studio Ghibli museum and the concert we went to!